JULIA ROSS OPENED JULIA ROSS PERSONNEL in 1988 but the agency quickly became Julia Ross Recruitment. Now the business is a listed entity called Ross Human Directions (RHD). And, about the only thing that has outpaced her name changes has been her company’s growth. The Julia Ross story is the tale of a self-made woman. Ross came to Australia as an executive and she now walks the corridors of her own $350 million tumour operation, which employs 500 workers and engages around 6000 contractors. “I had worked with an international recruitment group and came here from the United Kingdom with them originally, after running a few branches in England,” she recalls. “I was involved in their Western Australia and Asian business but took on a position as operations director for Australia, New Zealand and Asia,” Ross says. Accounting for her achievements, Ross thinks the retention of her people has provided continuity and a strong performance unit. “We had a very solid team for many years from when I started, certainly up until listing we had a very strong management team. I think the philosophy of promoting people internally and keeping stability of our own staff was very important,” she says. “I think some of the other things like innovations in the market have helped. We’re seen as being a little different and we sort of challenge the globe a little bit for our position in the market. We’re known to be quite fun and innovative and we have a different slant from our clients’ point of view,” Ross says. And it is these points of difference that have enhanced the brand, she says. Ross points to the secure employment test case in the New South Wales Industrial Relations Commission — which seeks variations in the number of public and private sector awards — as a major concern for her and the recruitment industry. Unclear on exactly where it might end, Ross says all sorts of things have been mooted, such as whether there’s an attempt to stop there being an external provider of casual employees to end users. There are also question marks over whether RHD’s casual workers will have to work to on—site agreements or whether they will have to be offered permanent work. The current business cycle does not support outsourcing, Ross says, but points out that unusual activities such as talent management and succession planning are being outsourced, driven by organisations trying to stop staff losses. The trend of women re—entering the workforce has been positive for Ross’s business. “We do our best to encourage it and I think temporary work is one of the ways that women achieve a gentle re—entry at whatever level that suits them,” she says. Another trend driving the growth of RHD is that businesses are more disposed to use a recruitment ﬁrm rather than advertising, and Ross believes this demonstrates the greater professionalism of both business and employees nowadays. 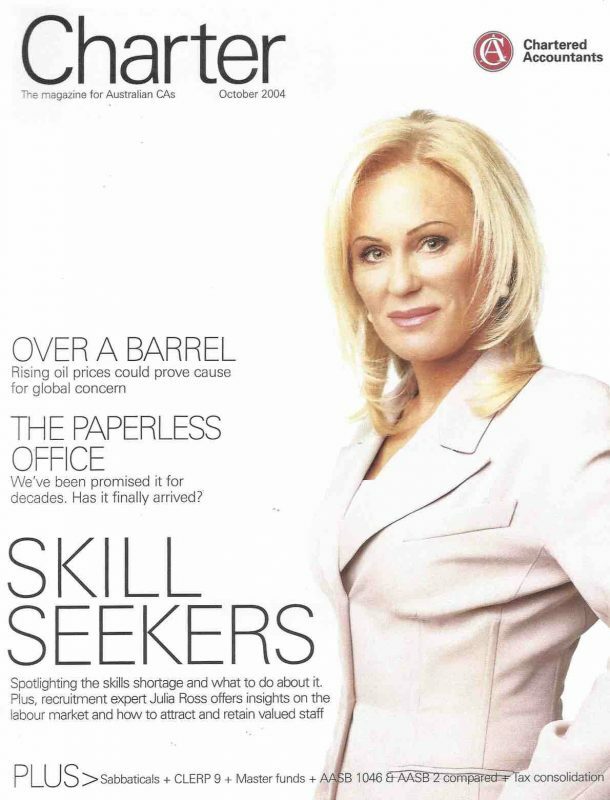 Ross says information technology (IT) jobs have improved considerably compared to two years ago and since her company’s acquisition of staffing consultants Spherion she is far more interested in IT recruitment. Ross’s tip for attracting and keeping great workers is to create flexible workplaces where people get a buzz out of being there. “Smart employers are offering flexible arrangements. People just don’t want to work in the same conformist way that many of us did,” Ross says. Ross says candidates often forego higher salaries so that they can get the work conditions that they want. “This generation sees quality of life and flexibility as being more important,” she says.